Scooping issues aside (I never add the right amount of batter to the liners), cupcakes are the good cops of the cake world. They never play half-baked mind games, and unlike some desserts I know, cupcakes won't 'tease' you into believing that all is well up until the eleventh hour (that's right layer cakes, I'm talking about you!). Cupcakes are my safety net, my comfort zone, the lovingly-worn grey cashmere sweater that I've had since high school. Cupcake...what an ingenious, to-the-point title. It's a cake that's small enough to fit inside a cup. I've yet to meet a cupcake that I don't like. Birthdays will always have an aura of whimsy about them. Even as adults, it feels as though we can let go of logic for a while and make magic happen on that day, Our day. My early thirty-something birthday was spent with close friends, scrumptious food, and killer margaritas (thanks, L.). It was lovely, quiet, and comfortable. And as usual, I made the desserts. Yes, I made two this year, and no, neither one included chocolate or *gasp*, lemons. I wanted a 'plan B' dessert, just in case my beloved cupcakes decided to pick up on the wily ways of their layer cake cousins. Oddly enough, the 'plan B' dessert happened to be a coconut-ginger layer cake. These cupcakes were a labor of love. 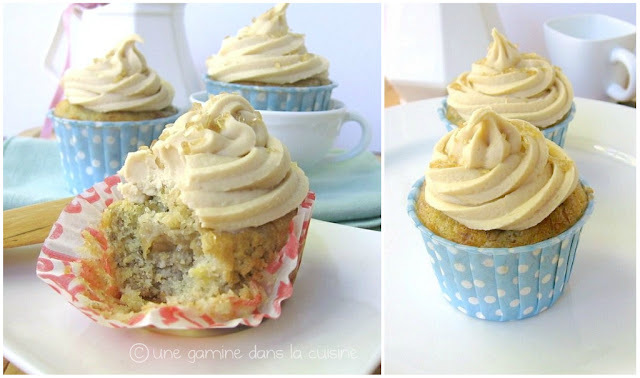 If you plan on making them, I suggest that you bake the cupcakes a day in advance, that way you can focus on the somewhat fussy, filling and frosting. It'll all be worth it in the end, I promise. The cakes are super-moist...similar to banana muffins, only not as boring. But it's the filling and frosting that elevate these babies to stardom. The filling is caramelized sweet milk, and the frosting is basically a whipped buttercream version of that filling. This put's the 'offee' in banoffee (it's a glorified toffee sauce). 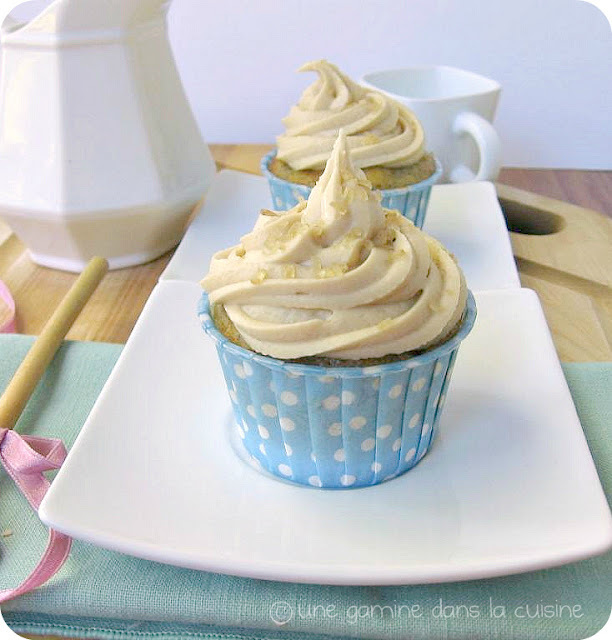 As you may have guessed, these cupcakes are on the sweet end of the sugary spectrum, ergo they're soul mate is a good strong cup of creamy coffee. I've accepted the fact that my layer cakes will never be symmetrical. Even though the coconut ginger cake was so lopsided that it appeared to have been baked by a rabid, one-eyed ferret, it was fabulous! I'll add the recipe soon. Preheat the oven to 350 F. and line a 12-cup muffin pan with cupcake liners. In a large bowl, sift together the cake flour, baking soda, baking powder, cinnamon, and salt. Whisk, and set aside. In the bowl of your stand-mixer, using the paddle attachment (a hand-held will work too), beat the butter and sugar together on medium speed until light and fluffy. Add the buttermilk and almond extract. Beat to combine. Add the entire bowl of dry ingredients and beat on low speed until just combined. Using a large rubber spatula, gently fold in the mashed bananas until they're evenly distributed throughout the batter. Fill each cupcake liner about 3/4 way full. 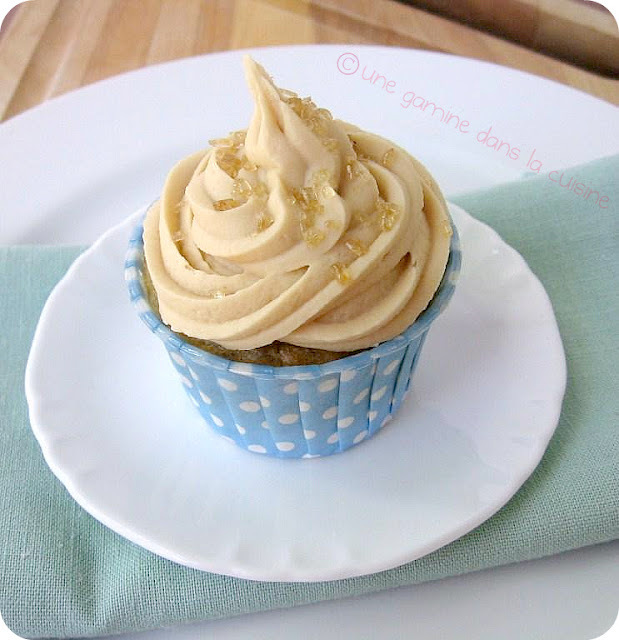 Bake for 18-20 minutes, or until a thin knife inserted in the center cupcake comes out clean. Remove from the oven and let the cupcakes rest in the pan for about 10 minutes before transferring them to a cooling rack. Cool completely before frosting. *Note: My frosting was too thick to spread with a spatula (it tore through one of the cupcakes), so I highly recommend using a pastry bag for this recipe. In a medium size, heavy-bottomed saucepan, combine the brown sugar, salt and water. Stir over medium heat until the sugar dissolves. Once the sugar has dissolved, stop stirring. Increase the heat and cook until mixture turns deep amber. Every now and then, use the handle of the pan to give it a gentle swirl (this will keep the toffee from burning). Lower the heat to medium and add the can of sweet milk and cut-up butter. Stir and cook for about 5 minutes, until the mixture begins to thicken slightly. Remove from the heat and set aside a about 2 Tablespoons of the thickened caramel (place it in a bowl, cover and leave it at room temperature). Pour the rest into the bowl of your stand-mixer (or any large heat-proof bowl). Let it cool for about 25 minutes. Every 5 minutes or so, give it a good stir to prevent it from becoming too thick. Prepare the frosting: Add about 1/2 cup of confectioners' sugar to the cooled caramel sauce. Beat on low speed until combined. Continue adding the confectioners' sugar in 1/2 cup increments until the caramel takes on the consistency of a frosting (this may, or may not take up to 5 cups). If it clumps up on you, add about 1 Tablespoon of milk or cream, but add it slowly as a little bit of liquid will go a long way. Spoon the frosting into a large pastry bag fitted with a large tip (I used a star). Frost the cupcakes as desired! A belated happy birthday to you! It sounds like you had a very special day! Happy birthday Valerie! It sounds like it was a wonderful day, and both desserts sound spectacular! Cake is always good, big or little, lopsided or not, and I can´t wait to see that coconut ginger cake recipe. p.s. I think I made an auto-posting boo-boo, as I won´t be home for another 2 weeks! Just in time for Thanksgiving and pie. What divine looking cupcakes! That flavor is irresistible. With cupcakes like these, no wonder your birthday was terrific! There's nothing like making your own dessert to ensure that you'll love it. Can't wait until you post the recipe for your layer cake. I have a weakness for desserts baked by rabid, one-eyed ferrets. You are so right, Valerie. The filling/frosting is fabulous! I can't wait to try it...don't you think it would be fabulous with a spice muffin? Or perhaps a pumpkin muffin? Frankly, I'd probably sit with a spoon and just eat it! Happy Birthday and I love the blue and pink! Belated HAppy Birthday Valarie...Hope you have a great year ahead.Your cupcake looks awesome...where did you get those pretty liners? Those cakes look delicious! 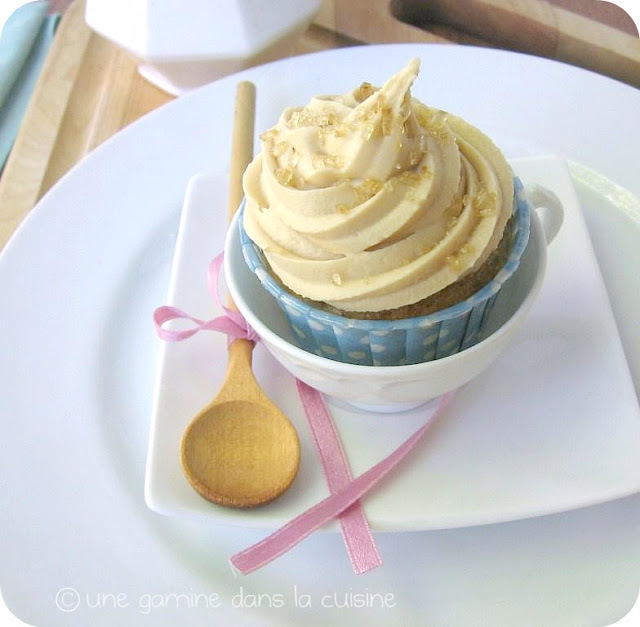 Love the idea of banoffee cupcakes, yum yum. You're right about cupcakes being a safe option to make! And I love your little bun cases! Was brought back to my pigtailed-hair days while looking at your pictures (especially the polkadot cupcake wraps underneath, love it! )...Thanks for sharing such a sweet recipe! TOO funny. Love your sense of humor!! Don't stop blogging. Or baking. Those cuppys look wonderful! !